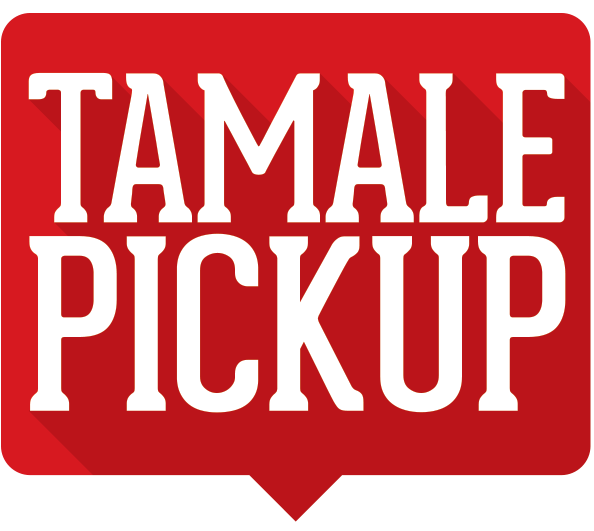 Chilito's sauces, Kika's Sauce (spicy or mild), is available at your local HEB stores. You already know that our Mild or Spicy Kika's Sauce™ is a fabulous way to dress up your favorite dishes. You can use it simply as a dip, salad dressing or hot sauce. But did you know that you can also cook with Kika's Sauce™? The possibilities are endless, and the flavor profile will blow you away! Here are a few recipes to get you cooking. Pick up Spicy or Mild Kika's Sauce™ at your local HEB (click above to find at your nearest store), or order on our website. Have a great recipe using Kika's Sauce™ that you'd like to share? Send it to us, and it may be featured on our site! 1. Heat an empty heavy or cast iron skillet on medium. 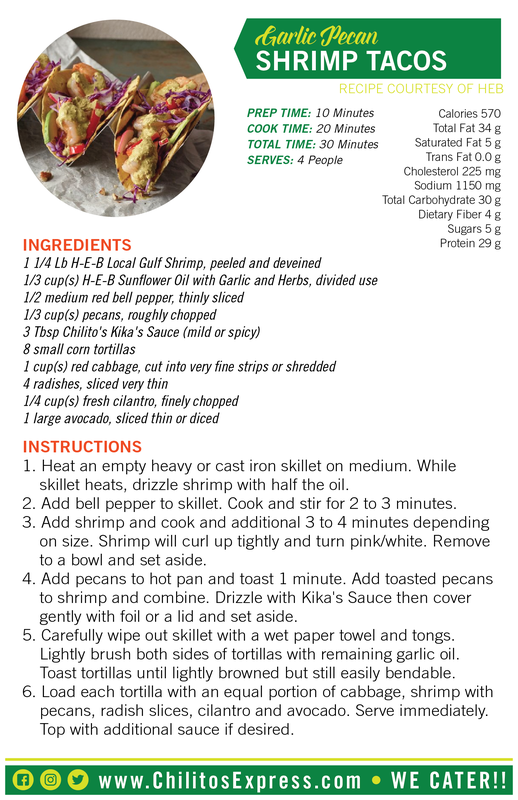 While skillet heats, drizzle shrimp with half the oil. 2. Add bell pepper to skillet. Cook and stir for 2 to 3 minutes. 3. Add shrimp and cook and additional 3 to 4 minutes depending on size. Shrimp will curl up tightly and turn pink/white. Remove to a bowl and set aside. 4. Add pecans to hot pan and toast 1 minute. Add toasted pecans to shrimp and combine. Drizzle with Kika's Sauce then cover gently with foil or a lid and set aside. 5. Carefully wipe out skillet with a wet paper towel and tongs. Lightly brush both sides of tortillas with remaining garlic oil. Toast tortillas until lightly browned but still easily bendable. 6. Load each tortilla with an equal portion of cabbage, shrimp with pecans, radish slices, cilantro and avocado. Serve immediately. Top with additional sauce if desired. 1. Heat a heavy, empty skillet on medium-high (cast iron works great for this). 2. Rub fish on both sides with 2 teaspoons of oil. Sear about 4 to 5 minutes on each side to golden brown. 3. Remove fish from skillet and cover loosely with foil. 4. To same pan, add remaining oil, shallots, bell pepper and corn. Stir and cook 4 to 5 minutes, or until shallots begin to soften and turn translucent. Remove pan from heat. 5. 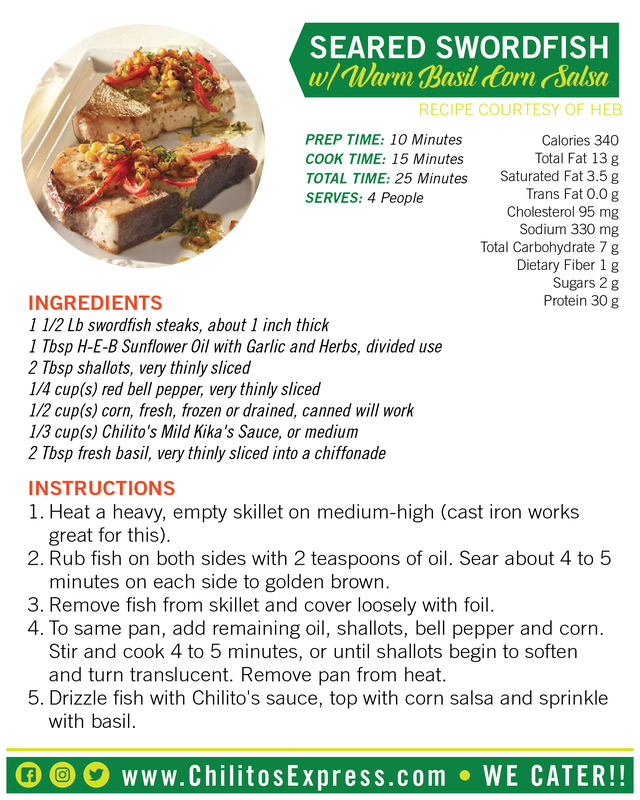 Drizzle fish with Chilito's sauce, top with corn salsa and sprinkle with basil. 1. Place oil in a large non-stick skillet over medium-high heat. 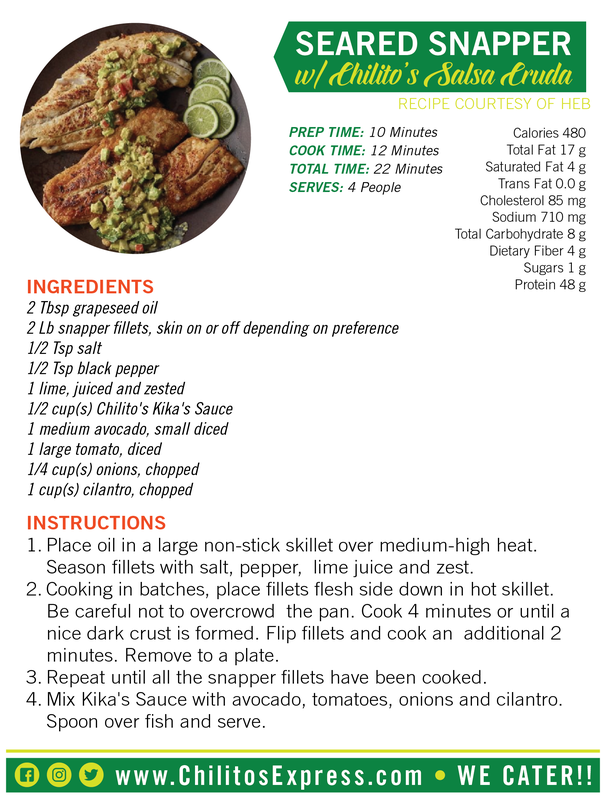 Season fillets with salt, pepper, lime juice and zest. 2. Cooking in batches, place fillets flesh side down in hot skillet. Be careful not to overcrowd the pan. Cook 4 minutes or until a nice dark crust is formed. Flip fillets and cook an additional 2 minutes. Remove to a plate. 3. Repeat until all the snapper fillets have been cooked. 4. 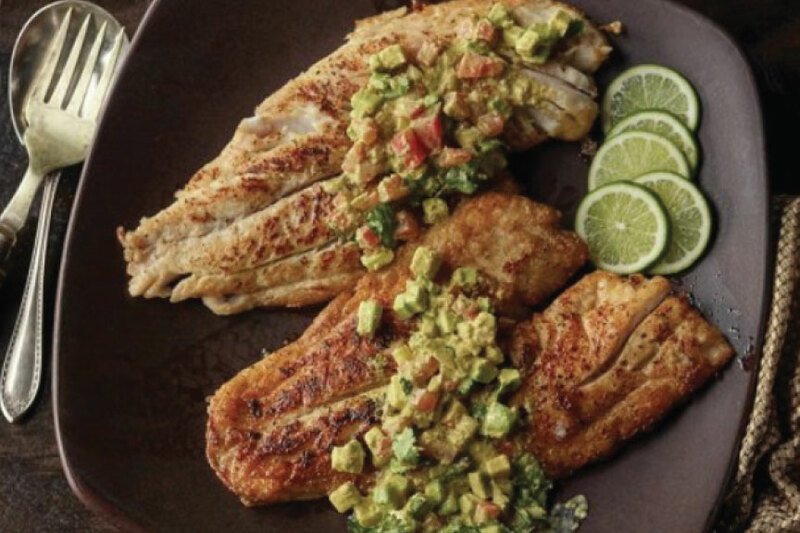 Mix Kika's Sauce with avocado, tomatoes, onions and cilantro. Spoon over fish and serve. 1. Combine the almond flour with the baking powder and garlic powder until it’s fully combined. 2. Melt the Mozzarella cheese and cream cheese. You can do this on the stove top or for 90 seconds in the microwave (stir at 45 second mark). 3. Once the cheese has melted, add the flour mixture and eggs and knead it until it forms a sticky ball. 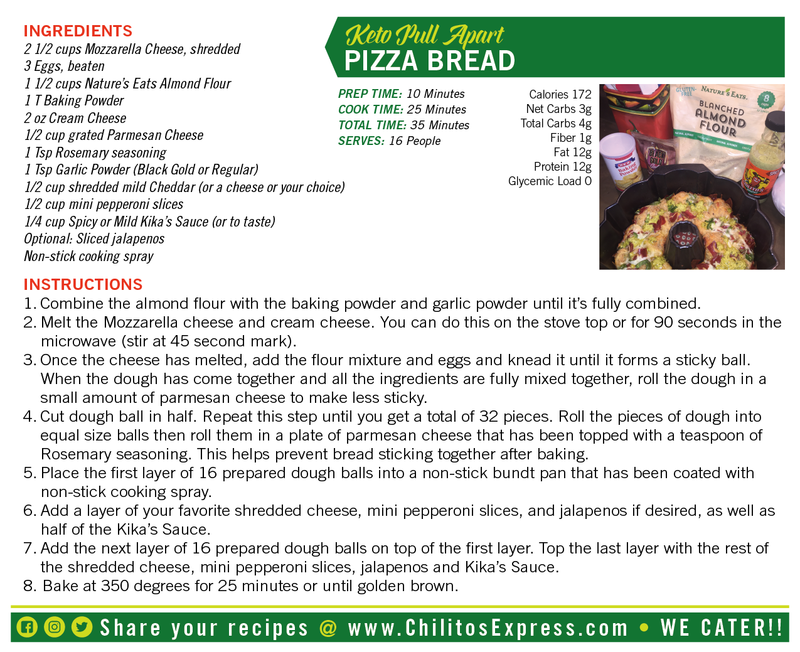 When the dough has come together and all the ingredients are fully mixed together, roll the dough in a small amount of parmesan cheese to make less sticky. 4. Cut dough ball in half. Repeat this step until you get a total of 32 pieces. Roll the pieces of dough into equal size balls then roll them in a plate of parmesan cheese that has been topped with a teaspoon of Rosemary seasoning. This helps prevent bread sticking together after baking. 5. Place the first layer of 16 prepared dough balls into a non-stick bundt pan that has been coated with non-stick cooking spray. 6. 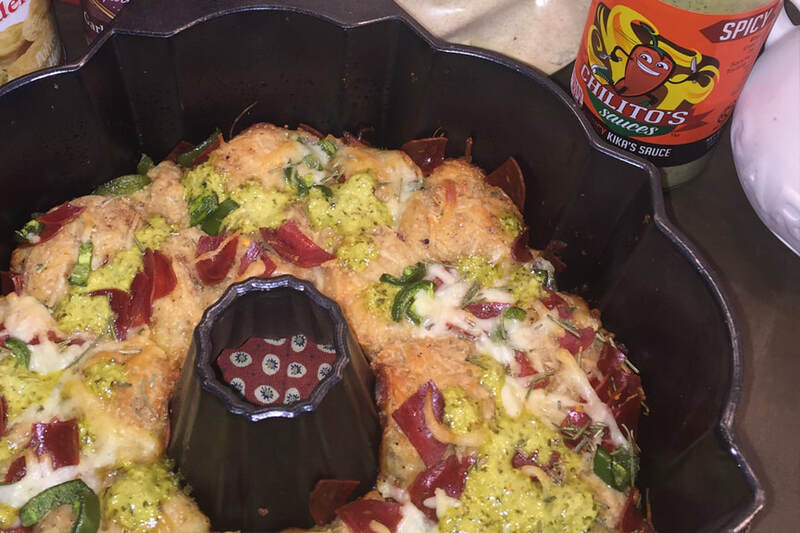 Add a layer of your favorite shredded cheese, mini pepperoni slices, and jalapenos if desired, as well as half of the Kika’s Sauce. 7. Add the next layer of 16 prepared dough balls on top of the first layer. Top the last layer with the rest of the shredded cheese, mini pepperoni slices, jalapenos and Kika’s Sauce. 8. Bake at 350 degrees for 25 minutes or until golden brown.